Brian and Elizabeth Swantek, left, are celebrating 25 years of marriage this year. The most devastating blow of those early years of married life came two days after Elizabeth Swantek’s Dec. 31, 1993 wedding: her father, William Thomas Shewan, died following a two-year struggle with lung cancer. The news reached Liz and Brian Swantek on their honeymoon. The newlyweds got into a car accident while trying to navigate icy roads on the way back to Erie for the viewing and funeral. When they and their damaged car finally arrived, they came home to a refrigerator that had stopped working. “We figured if we can make it through those first three days of marriage we can make it through anything,” Liz said. And 25 years later, they have. Liz and Brian Swantek were among more than 80 couples honored Sunday during a special Mass at Erie’s St. George Church for those celebrating a milestone anniversary this year. Also in the pews: Leo Swantek, Brian Swantek’s brother, who celebrated 50 years of marriage to his wife, Linda, on Saturday. Linda was ill and not able to attend. “We had good examples” to follow, Brian said. 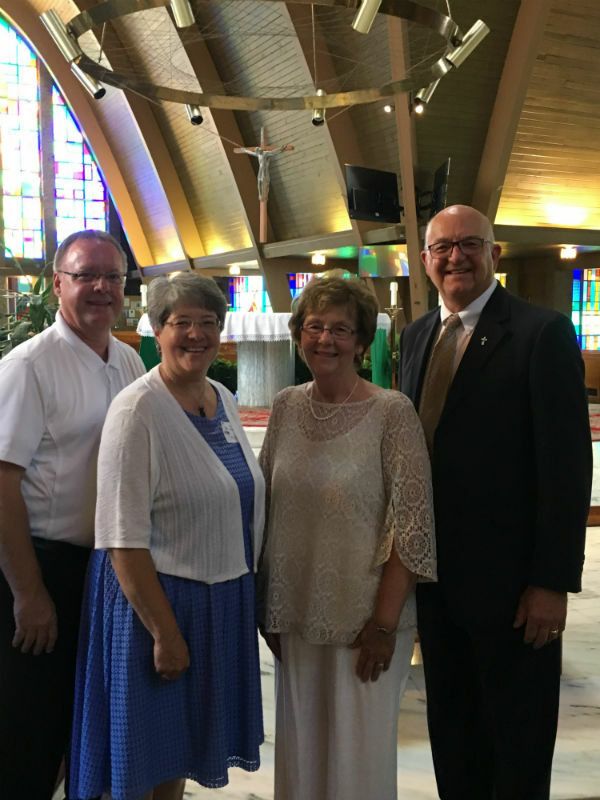 Two St. George deacons were also among those honored at Sunday’s Mass: Deacon Robert Ball and his wife, Patricia, celebrating 50 years of marriage, and Deacon Steve Washek and his wife, Vicki, celebrating 35 years. Deacon Robert Ball and his wife, Patricia, are celebrating 50 years of marriage this year. 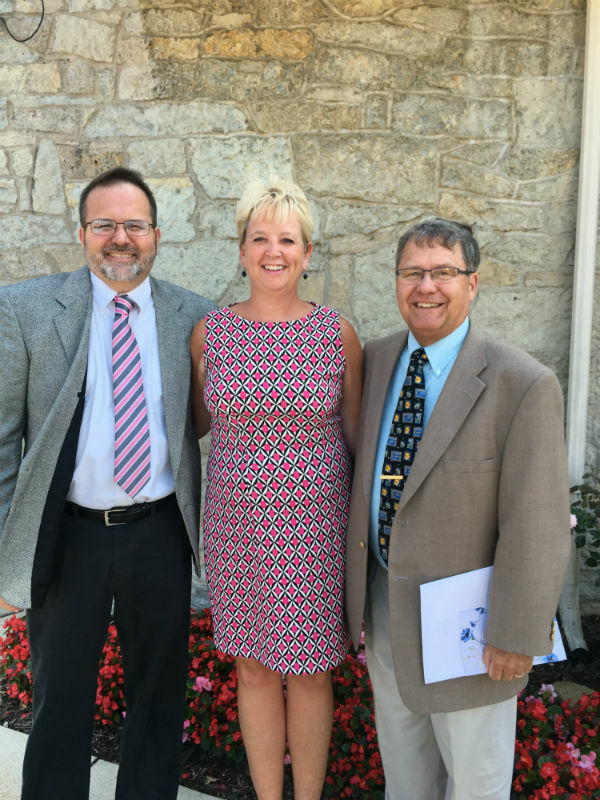 Deacon Steve Washek and his wife, Vicki, are celebrating 35 years. Masses celebrating milestone anniversaries – 25, 50, 60 years and more – are held at different churches throughout the Diocese of Erie each year. As part of the event couples are given a scroll recognizing their anniversary and are treated to a reception. Ss. Cosmas and Damian Parish in Punxsutawney will also hold a special anniversary Mass this year on Aug. 19. Both Swantek men grew up Catholic, as did their wives, with a belief in the sanctity and sacredness of marriage. For Leo Swantek, married life began with an ultimatum: after five years of dating, Linda was ready to take the next step and told him so. They were married Aug. 3, 1968. “I knew she was my only one,” said Leo, who is 21 years older than Brian. A half-century of marriage has brought plenty of joy – Leo and Linda raised four children – but also tragedy, including the death of one adult son from an accidental drug overdose. As with every challenge, they turned to each other – and their faith. In the early years of Brian and Liz's relationship, date nights meant going to evening Mass together. Even if they didn’t see each other during the week, they knew they would see each other at church. Now empty-nesters – their daughters, Natalie and Kelsey are away at college – they’ve embarked on a new adventure of visiting churches throughout the diocese. They simply enjoy each other’s company, Brian said. Leo and Linda attribute the success of their marriage, in part, to their ability to share responsibilities and communicate. “The No. 1 thing is always, always, always talk to each other,” Leo said. “If you have a fight, you’ve got to resolve that. Never go to bed angry. You’ve got to talk." “And the other person has to listen,” Linda added. Marriage also requires honesty and compromise, Brian said. To register for the Aug. 19 Mass at Ss. Cosmas and Damian Parish in Punxsutawney, visit www.eriercd.org/familylifeoffice/anniv.html by Aug. 10.